RV winter camping is an excellent option for those who want to continue to enjoy camping activities when it is cold outside. Since recreational vehicles are self-contained and typically have built in heating systems, traveling in a camper or motor home is a great way to enjoy the comforts of home when you are on the road, even when it is cold outside. That's what makes year round travel and full-time RV living possible for camping enthusiasts who don't want to be homebound during the winter months. It's important to be aware that camping and traveling by RV during the winter months is not the same as engaging in the same types of activities when the weather is more temperate. If you plan to engage in RV travel during the winter months, be sure that you are well prepared for your camping trip before setting out on the road. A few tips that you may want to follow are detailed below. 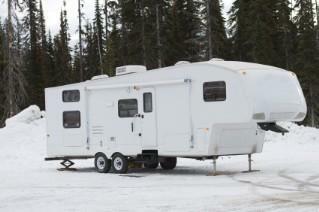 In some locations, RV parks close for the winter. Before you decide to travel to a location, especially to an area where heavy snow is common, be sure to find out if it is likely that you will be able to find an open campground. Some campgrounds in the mountainous areas of North Carolina or New Mexico, for example, close for the season in late November or early December. They may close earlier in areas that are further north. Campgrounds in warm states like Florida and Texas, however, may stay open all year. The last thing you want to do is arrive at your destination to find that there is nowhere to camp or that all of the local activities are closed for the winter. Before setting out on a winter camping trip, have a qualified RV maintenance professional check the unit to ensure that it is in road worthy condition and to verify that all of the systems are in good enough shape to handle the winter temperatures on the road and at your destination. Before setting out on the highway for an RV winter camping adventure, be sure that your camper and tow vehicle have the right type of tires for the weather conditions you are likely to face during your journey. It may be best to contact an RV supplies retailer in the area where you plan to travel to find out what types of tires are recommended for locals. Even though you can control the temperature inside your camper, it will still be cold outside. You don't want to find yourself having to spend all of your vacation time huddled beside the heater in your travel trailer or motor home. Be sure to pack plenty of warm clothing, particularly items that can be worn in layers. If your RV uses propane for heat, be sure that your tank is full before you set off on a camping trip. Depending on how long you will be gone and how remote the area where you will be traveling is, you may want to bring an extra tank with you. A working carbon monoxide detector is a must for every gas-heated RV. If your camper doesn't have one, install one. Test the carbon monoxide detector in your camper so that you can be sure that it is working properly. No matter what the weather forecast says before you leave town, there's always a possibility that you'll find yourself facing severe weather during your trip. Never set out on an RV trip without appropriate safety and survival gear. Be sure to pack a first aid kit, flashlight, weather radio, and other safety items. A winter safety kit should include plenty of warm blankets as well as extra socks and gloves. You'll greatly increase your chances of having an enjoyable winter camping experience if you take the time to make sure that your RV is in great shape before you set off on a winter camping adventure. As long as you have realistic expectations about the conditions you are likely to face, your camper is properly prepared and you have packed appropriate clothing and supplies, you'll likely have a great experience on your trip.